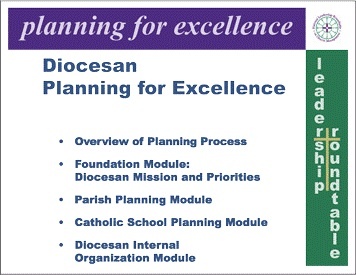 A step-by-step guide for a clear and powerful strategic planning process for dioceses to address planning for mission, parish planning, schools planning and internal organization planning. Publications, 2009), a valuable and practical resource that supports the Leadership Roundtable’s Diocesan Planning for Excellence. To download an overview of the content of each chapter and “The Case for Prophetic Planning” click here.